, an ingenious artist, was born at Agen in France, about 1524. He was brought up as a common labourer, and was also employed in surveying. Though destitute of education, he was a very accurate observer of nature; and in the course of his surveys, he conceived the notion that France had been formerly covered by the sea, and propagated his opinion at Paris, against a host of opponents, with the greatest boldness. It was considered as a species of heresy. For several years after, he employed himself in trying different experiments, in order to discover the method of painting in enamel. 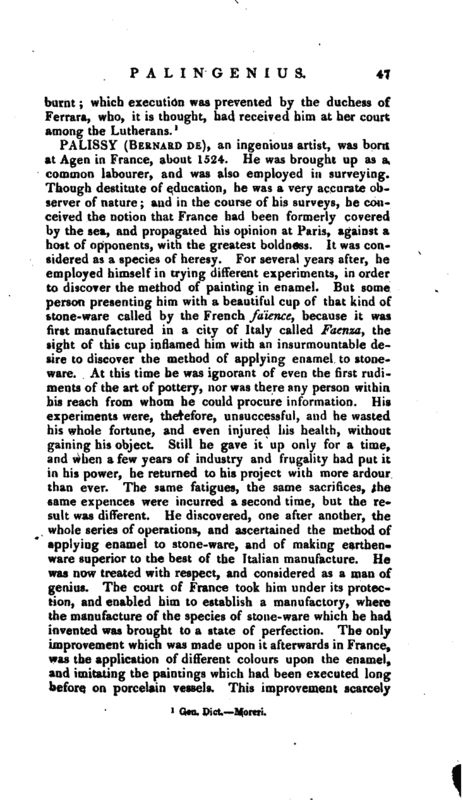 But some person presenting him with a beautiful cup of that kind of stone-ware called by the French faience, because it was first manufactured in a city of Italy called Faenza, the sight of this cup inflamed him with an insurmountable desire to discover the method of applying enamel to stoneware. At this time he was ignorant of even the first rudiments of the art of pottery, nor was there any person within, his reach from whom he could procure information. His experiments were, therefore, unsuccessful, and he wasted his whole fortune, and even injured his health, without gaining his object. Still he gave it up only for a time, and when a few years of industry and frugality had put it in his power, he returned to his project with more ardour than ever. The same fatigues, the same sacrifices, the same expences Were incurred a second time, but the result was different. He discovered, one after another, the whole series of operations, and ascertained the method of applying enamel to stone-ware, and of making earthenware superior to the best of the Italian manufacture. He was now treated with respect, and considered as a man of genius. The court of France took him under its protection, and enabled him to establish a manufactory, where the manufacture of the species of stone-ware which he had invented was brought to a state of perfection. The only improvement which was made upon it afterwards in France, was the application of different colours upon the enamel, and imitating the paintings which had been executed long before on porcelain vessels. This improvement scarcely | dates farther back than thirty or forty years. It was first put in practice by Joseph Hanon, a native of Strasbourg, and was suggested by a German, who sold to Hanon the method of composing the colours applied upon the porcelain of Saxony. These vessels were soon after superseded by the Queen’s ware of the celebrated Wedgewood, which both in cheapness, beauty, and elegance of form, far surpassed any thing of the kind that had appeared in Europe. After Palissy had thus succeeded in his favourite object, he pursued the science of chemistry, and applied his knowledge to the improvement of agriculture. 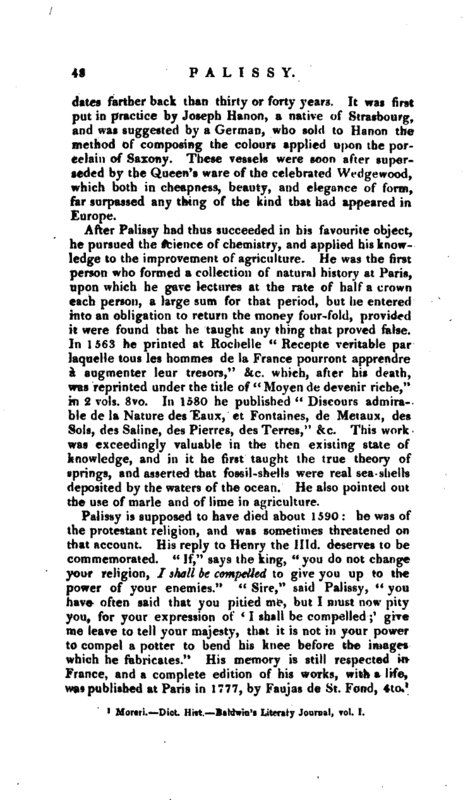 He was the first person who formed a collection of natural history at Paris, upon which he gave lectures at the rate of half a crown each person, a large sum for that period, but he entered into an obligation to return the money fourfold, provided it were found that he taught any thing that proved false. In 1563 he printed at Rochelle “Recepte veritable par laquelle tous les hommes de la France pourront apprendre a augmenter leur tresors,” &c. which, after his death, was reprinted under the title of “Moyen de devenir riche,” in 2 vols. 8vo. In 1580 he published “Discours admirable de la Nature des Eaux, et Fontaines, de Metaux, des Sols, des Saline, des Pierres, des Terres,” &c. This work was exceedingly valuable in the then existing state of knowledge, and in it he first taught the true theory of springs, and asserted that fossil-shells were real sea- shells deposited by the waters of the ocean. He also pointed out the use of marie and of lime in agriculture. Moreri.—Dict. 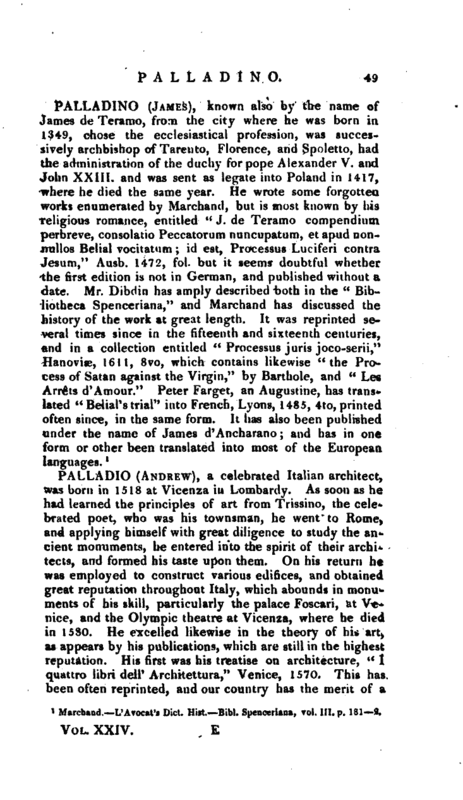 Hist.—Baldwin’s Literary Journal, vol. I.